A goldfish named Ian is falling from the 27th-floor balcony on which his fishbowl sits. He's longed for adventure, so when the opportunity arises, he escapes from his bowl, clears the balcony railing and finds himself airborne. Plummeting toward the street below, Ian witnesses the lives of the Seville on Roxy residents. There's the handsome grad student, his girlfriend, and his mistress; the construction worker who feels trapped by a secret; the building's super who feels invisible and alone; the pregnant woman on bed rest who craves a forbidden ice cream sandwich; the shut-in for whom dirty talk, and quiche, are a way of life; and home-schooled Herman, a boy who thinks he can travel through time. Though they share time and space, they have something even more important in common: each faces a decision that will affect the course of their lives. Within the walls of the Seville are stories of love, new life, and death, of facing the ugly truth of who one has been and the beautiful truth of who one can become. Sometimes taking a risk is the only way to move forward with our lives. As Ian the goldfish knows, "An entire life devoted to a fishbowl will make one die an old fish with not one adventure had." 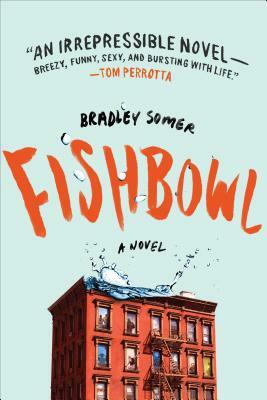 Bradley Somer's Alberta Literary Award winning Fishbowl is at turns funny and heartbreaking. Bradley Somer holds degrees in Archaeology and Anthropology and spent many years tromping through the wilds of Canada and the US, the scrub brush of Australia and along the beaches of the Caribbean looking for artifacts to fill in the hidden stories of human prehistory. He now just makes up stories because it’s easier. Fishbowl is Bradley’s second award winning novel and was listed as one of the eight best books of 2015 in The San Diego Union-Tribune.